1932 New York Safety Sticker - $20.00 : Bob Hoyts Classic Inspection Stickers, Add a Final Touch to your Restoration! 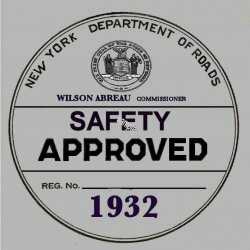 This 1932 New York Safety sticker was reported to be used used for roadside stops and by car dealers to cooperate with the cause of safety. New York opened its first inspection stations in late 1953, but this early sticker can be considered a real time addition to identify the year of your classic car. This sticker is copyrighted and has our patented "Peel and Stick" format which allows the sticker to be fastened to the inside of your windshield.